Giving birth to one baby seems enough for one set of parents, but for others, they are graced with the miracle of being able to give birth to twins. In today’s world, it seems that more and more women are having twins then ever before. It’s said that there is a 1 in 80 chance of giving birth to twins. In ancient times and in today’s world, there are plenty of twins who have come to the forefront and been able to make their mark in history. Some of these twins you’ve most definitely heard of, while others may not be so prominent in your mind. In any case, all of these twins have made some sort of impact in the world. These twins are definitely the most notorious on the list. The Kray Brothers became well known for being the perpetrators of organized crime during the 1950s-1960s in the East End in London. Ronnie, a paranoid schizophrenic, and Reginald lived a life of violence, often participating in arson, torture, assaults, armed robberies, and murdering many, including George Cornell and Jack McVitie. Despite their violent and crude nature, the twins could be found spending time with very popular entertainers such as Judy Garland and Frank Sinatra. In 1968, the twins were arrested and sentenced to life imprisonment and have both since died. In ancient Roman mythology, Romulus and Remus were the twin brothers born to Vestal Virgin Rhea Silvia and Mars, the god of war. As a common practice in Rome at the time, the two boys were abandoned in a remote location as they were unwanted. In time, the two were found by a she-wolf, who looked after them as if she was the boys’ mother. 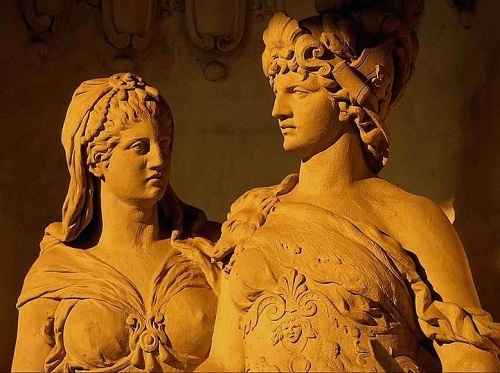 After growing up, the pair founded the great City of Rome, which soon became a flourishing empire. 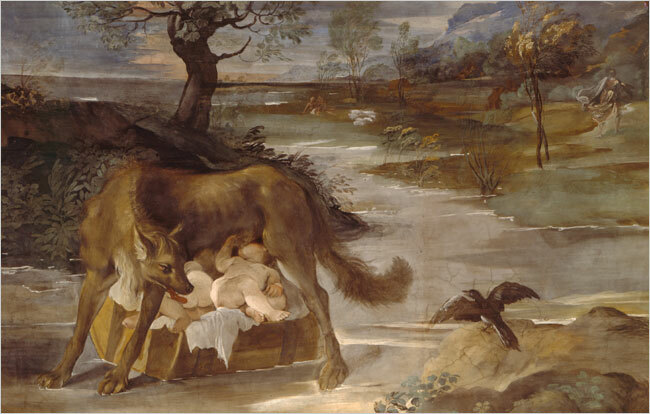 However, the twin boys would soon dispute the land, and in the end Remus is killed by Romulus, possibly providing for the reason why Rome is named as it is. Apollo and Artemis, the son and daughter of Leto and Zeus, are two very important and popular figures in Greek mythology. They are twins and were born on the island of Delos. Artemis is said to the most Greek of all of the gods. He is a musician and is usually seen with his golden lyre. He masters the silver bow and teaches medicine and healing, but is also the god of light and truth. Artemis is his sister who is the goddess of wild things, including hunting. She is a virgin goddess and is the goddess of childbirth, as Leto experienced no pain when birthing her. However, she is also a warrior that seeks revenge. Maybe athletics do run in the family, at least with identical twins Ronde and Tiki Barber that seems to be the case. At one point, both men were professional football players in the NFL and both do some sort of broadcasting. Ronde plays for the Tampa Bay Buccaneers while Tiki played for the New York Giants. The twins became famous once they started their careers in the NFL, and today still have a major impact on society and football fans alike. Ronde is a correspondent for the Today’s Show while Tiki spends time as a sports broadcaster. Not many twins have such a similar career path! The Bunker twins were born on May 11, 1811 in Siam, which is known Thailand. 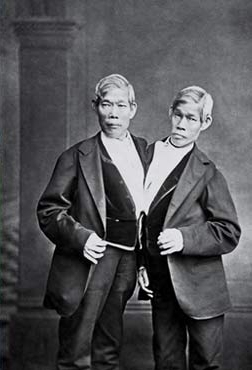 Since the two were born in Siam and were connected by a piece of cartilage at the sternum, their condition became known as Siamese twins. The brothers both had livers, but they were fused. In today’s world, the twins could have easily been separated, but 19th century medicine wasn’t fit for that type of surgery. The brothers were exhibited during a world tour after being discovered by Robert Hunter, but soon after settled down and became U.S. citizens. Both men were able to marry and even had children. The Bunker brothers are famous for being the first widely known pair of Siamese twins. In 1874 Chang had contracted pneumonia and died, but Eng was still alive. Doctors offered to separate them but Eng declined, dying three hours later. Jenna and Barbara Bush make the list as they are “The First Twins.” The Bush daughters are the first twins to ever live in the White House. They were born on November 25, 1981 and are the only children of George W. and Laura Bush. During their stay, the sisters took on several activities such as writing books, attending presidential events, and helping with campaigns that dealt with learning. Though the twins have since moved out of the White House, they did give advice to the newcomers. Robin and Maurice Gibb are definitely some of the most influential people in the world, despite the fact that they are twins. Being separated by only 35 minutes, the twins would make their round in history by creating the worldly famous band The Bee Gees. After starting their band in Australia, the twins along with another brother, Barry Gibb, eventually made a breakthrough after traveling to England. The Bee Gees have since won nine Grammy Awards, five American Music Awards, a World Music Award, and plenty of inductions, including one into the Rock and Roll Hall of Fame. Unfortunately, Maurice Gibb passed away on January 12, 2003, after suffering a heart attack. Ann Landers and Abigail Van Buren were born in Sioux City, Iowa on July 4, 1918. Though identical twins, the two sisters didn’t look too much alike, as Landers had surgery to correct a deviated septum. However, both were seen as idols to many women during their time. The twins worked together and even had a joint wedding. When Landers started her 1955 column, Abigail also decided to write one of her own after helping her sister. Both women soon became very popular columnists and even became competitive at one point which drove them to not speak to each other for about 10 years. Known for their famous Dear Abby, the sisters are said to have received about 15,000 letters each week with about 200 million readers. Best known for sharing the part of Michelle Tanner on the show Full House, Mary Kate and Ashley Olsen are definitely one of the more prominently known twins in today. The two also seem to be the youngest twins to become famous, officially being hired as actresses at the age of six months. After growing up, the sisters went on to star in plenty of movies, television series, and then split to move onto their own careers. The sisters also have dolls, a clothing line, and other items in their names that continue to keep them in the spotlight. I love the Gibb brothers and all of their music. Good list! I'm a twin 🙂 every generation of my family has (or has had) at least two sets of twins. I find it interesting that you said Robin and Maurice Gibb were separated by *only* 35 minutes, because when it comes to twins, such a broad time interval is much less common than being born, say, 10 minutes apart, or often less. "(10. Jacob and Esau)-While not the most famous of all twins they may have been the first twins born." I'm pretty sure we can find older twins than them, for example: Castor and Pollux from Greek mythology. I'm forced to agree that the Olsens are the most famous twins in history, which speaks more to our cultural failings than to the talent of the Olsens–who really weren't good at anything but reading cue cards and looking cute. They were stupendous comic foils to Dave Colias' quips. Olsens? For What? It took TWO of them to play one little idiot who could barely utter a simple sentence. They look like poster girls for war orphans. Why do you specify that some of the twins are from ancient Roman or Greek mythology, but do not make the same claim of the mythology of the Abrahamic religions when discussing Jacob and Esau? As belief systems they are all equally valid! I added the Esau and Jacob twins when I edited the list. I personally believe the validity of the Bible and I confess proudly I am a Christian. This does not mean I don't respect the views of others, only that I am sure of my own faith and so when I discuss it, it is with certainty. I am not looking to turn this into a forum defending or persecuting Christianity but I did want to claim that I was responsible for the Esau and Jacob addition to the list, not the listed author, Ash. Jacob and Essau came from Biblical times. Which was WAY before Greek mythology. Last night me and ma friends discussion same topic……there are two brother which are my favorite, They are in Australian cricket. The elder Michale Hussey and David Hussey, Both are Rocks in Australian Cricket Team. This is a nice list but why does it include fictional (i.e. mythological) characters? Jacob and Esau? Judaeo-Christian mythology described her as if they were historical. Romulus and Remus as well as Apollo and Artemis are at least properly identified as mythological characters. To the creator of this list: Don't treat some mythologies as if they were historical narratives. They're not. Dola – Jacob and Esau were factual people that lived, the other two sets of twins you mentioned are mythology. Just because you don't want to believe the Bible doesn't mean the people in it weren't real. One mythology is as good as the other. They're all pieces of fiction. Treating them as fact is when belief turns to delusion. Keeping belief and facts separated helps not to draw the wrong conclusions from things. In this list, this has been blurred. Of course Christianity is real, there is no doubt about that. And never would I doubt what I see with my own eyes. When I walk out my front door I see two churches, a Catholic and a Protestant church. Every morning at 0700 hours I hear the church bells, same at 1200 and 1900, every single day. There's no doubt about Christianity. It exists, it's real. And so is the mythology that it is based upon. When I reach up into my bookshelf then there I find the Bible. I also find comprehensive works on Graeco-Roman, Norse, Egyptian and other European, Middle-Eastern and North-African mythologies. On another shelf there's Tolkien, and of course there's a complete edition of Sherlock Holmes and Shakespeare right there with the others. They're all real. They're printed, I can hold them in my hands, I can read them. Never would I presume to say that literature is not real. I love a good book. However, is a literary work an accurate depiction of facts? I'm sure that most of us will agree that it is not so. Authors invent their stories, make up characters. Even historians have to interpret their sources to arrive at what is the most likely reflection of true events. Take everything you read with a grain of salt unless it can be proven or disproven. Take this statement the same way. Go and look out your windows, go and look at your bookshelves. Go out into the world and stand in front of a castle. You'll see an impressive building and you know there is a lot of history in these walls. Maybe it dates back into ancient times, maybe it's medieval. Looking at the building, digging at its foundations, reading historical sources, you'll get some idea of what happened to this building. But can you ever be certain of every little detail? I think not. You'll find there are things that can be proven and other things that cannot. Those that cannot are merely fun to look at, fun to think about. They'll engage our sense of creativity, or romance when thinking of the olden days. But they're of no use in the world of hard evidence, logic, reason and facts. Look at Christian Mythology. Like with Greek legends, such as the fall of Troy, you'll find kernels of truth. And you'll find answers to unanswerable questions as people who lived thousands of years ago imagined them. You'll also find words that have long since changed their meaning, that have been translated and translated a countless number of times and that, on top of this, were originally designed often to allude to something, to be deliberately vague. Is there some possible truth in this? Definitely, some archaeological evidence has been found. Is everything to be taken literally, as a fact? Definitely not. Some things have been scientifically disproven. Well said, Dola. I hope you plan on being a frequent reader and commenter. Eloquent and thought-out opinions are always welcomed at TopTenz. The Bible isn’t fictitious, like the mythological Greek figures mentioned here. The Bible. Is. Fact. They are lovely sister musicians from Canada. publicly predict the 9/11 attacks. They rocked on Tyra Banks last year! Check out their website http://www.psychictwins.com. I am a twin we are 63 years old now but we are not alike really in looks or personality, many people don't hink we are twins at all. Of course not all twins look alike some are quite different to look at. and in their personalities as i have mentioned in my comment. My story is about the Kray twins who came from Bethnal Green east London like myself. I never knew them at all i wouldn't have wanted to know them as they were terrible people in my book thugs who kept the Bethnal Green and other area's in London in the grip of fear with their so called firm of henchmen. And all this rubbish about they never touched anyone who wasn't a gangster is untrue i was in a pub in Bethnal Green one night and they came into the pub and everyone knew who they were and moved away and the other customers looked really afraid. One man looked over at the twins and Ronnie said something to Reggie and this man went outside to the toilet and they followed him into the toilet and they returned to finish their drink and left glad to say. When another customer went into the men's toilet this poor man had been badly beaten up by the krays and had to go to hospital. He said he had never seen them before athough he knew who they were another customer had told him when they came in. So he was beaten up just because he looked their way. That ish was crayyyyy lol. Anyways why my girls Tia & Tamera not on this? Ummm in number 7, “Artemis is said to the most Greek of all of the gods.” Artemis should be changed to Apollo I think. In the next few lines Apollo is described and then it talks about Artemis again.